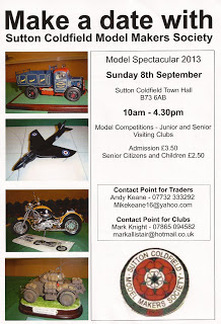 The ASVC posse turned out in force for Sutton Coldfield with myself Jaymes, Paul, John and Martin manning the tables. We were pleasantly surprised to find we had two tables and they were two deep! For those that have visited the show before we were situated down the few steps to the left in the old competition hall. The show opened promptly and a steady stream of visitors browsed happily throughout the day, it may be worth noting here that there was also a steady stream of purchases been made by our members right from the off, the bulk buy award goes to Martin with double figures on his purchases by the end of the day. The competition room was well supported by a varied amount of great models on display, once judging had been completed Jaymes and Paul went to see how they had got on. Seeing Jayme's face as he returned to us tipped us that he had done well but when Paul returned and we discovered we had done a clean sweep in the Military vehicles 1:72 and smaller category we were all very pleased.